Every time I go shopping at Gelson's — any Gelson's, anywhere — I am compelled to stop in their bakery department, which is filled with magical confections by the exceptional Viktor Benes. This is not your standard, treacly, plastic supermarket fare, this is gorgeously delicious pastry. I'm serious. VIKTOR BENES Princess Cake, from Gelson's in Valley Village, California. And of all the glorious choices in the abundant display cases, my very favorite is their princess cake. 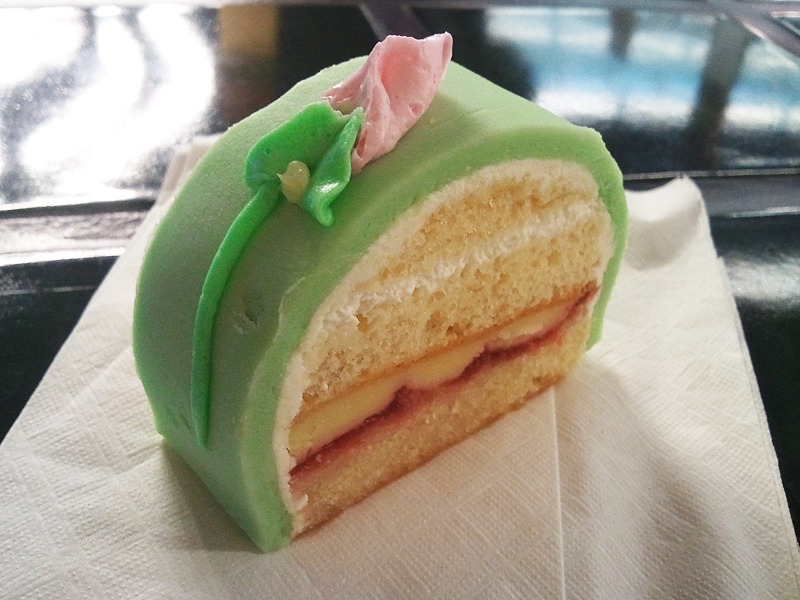 Have you ever had princess cake? It's hella good, and...it's hella pretty. You know I love it. It's breathtakingly simple: light yellow cake layered with whipped cream, a hint of custard and raspberry jam, domed in bright green marzipan. Who doesn't deserve a sweet little reward after walking all those lonely aisles shopping for...whatever? Viktor Benes makes the best princess cake I've ever had (and it's even better when you're wearing heels). Feel free to challenge me and tell me you've had better. I'll happily devour it.